Quinoa bowls are a simple and versatile but satisfying dinner that comes together quickly for busy weeknights. 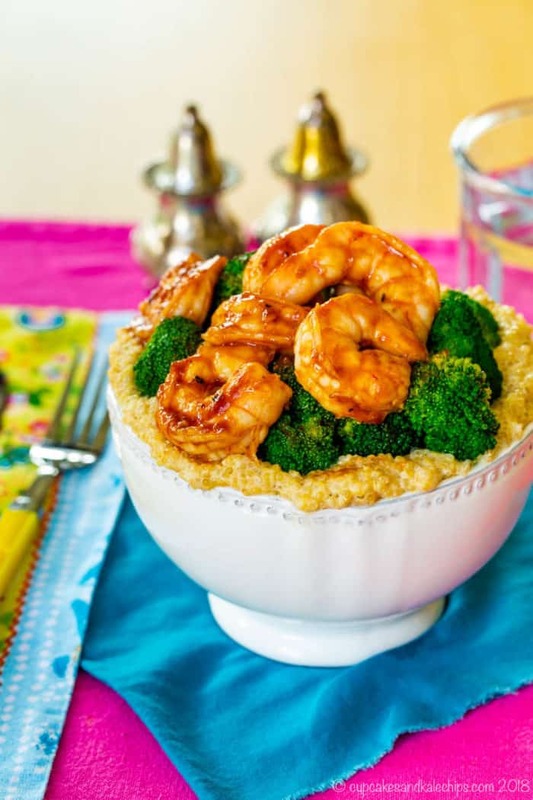 Sauteed shrimp tossed in BBQ sauce is added to a bowl with quinoa and steamed broccoli. Healthy and kid friendly. BBQ Shrimp Quinoa Bowls are a healthy dinner idea for tonight or any night! 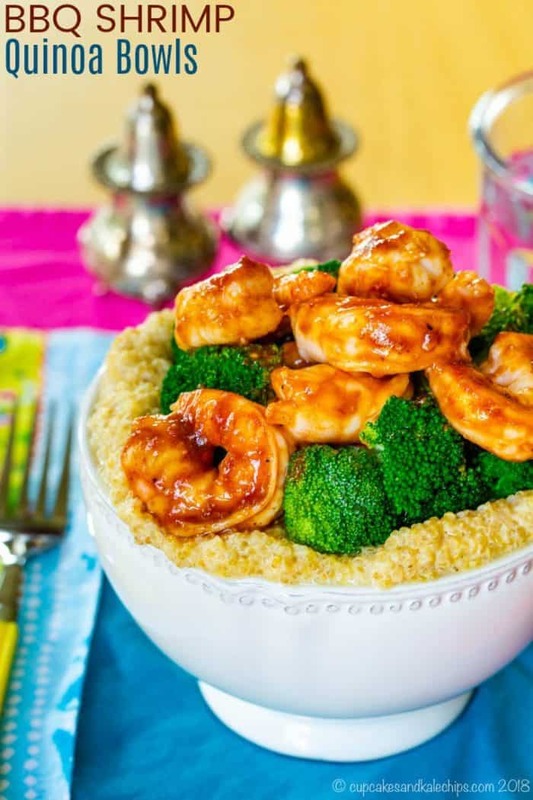 With sauteed shrimp in BBQ sauce, broccoli and cheese served with quinoa, this healthy quinoa bowl recipe becomes a kid-friendly meal! Clearly we usually have multicomponent meals. Not necessarily complex, so don’t think I am superhuman or bragging or anything. After all, I make rice in a rice cooker, sweet potatoes are baked in the oven, and sometimes our veggies are frozen and cooked in the microwave. They definitely include more than a single item, though, and always have components that he loves. So what do you think his response is? Seriously kid?! I give up. Here’s some Spaghetti-Os. Not really. I am definitely of the “one meal for the whole family” school of thought, and I think that is part of the reason why he likes a pretty diverse array of foods. Though I get the feeling he spoiled me, and Smiles is gonna be one of those kids who only eats white food. But there is no plain white food in a BBQ shrimp quinoa bowl. 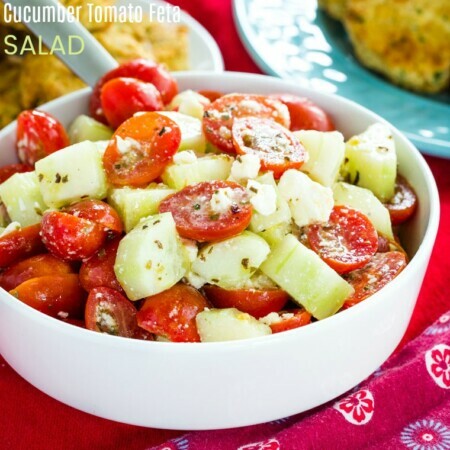 Yet it is still healthy, super simple and perfect for crazy weeknights. What is a quinoa bowl? A quinoa bowl is a meal with quinoa as the primary ingredient, and of course, the meal is served in a bowl. 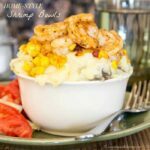 Bowl meals are popular because they are versatile, with the ingredients easily swapped for whatever you have on hand and/or using flavors your family enjoys. 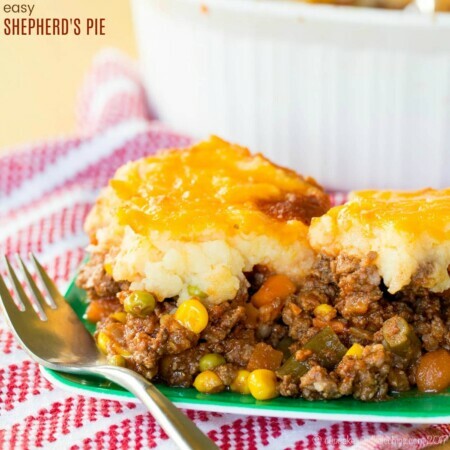 And what you need for a weekday supper is something that is not only easy, but also versatile. Don’t like shrimp? Have it with grilled chicken, or, like we did the other night, some turkey kielbasa or other sausage. Bored with plain steamed broccoli? Roast it. Nuke a freezer bag of it. All out of broccoli? Toss in some snap peas or another veggie. Or don’t. I won’t tell. Are Quinoa Bowls Gluten Free? Just be sure to choose a sauce that isn’t made with any gluten-containing ingredients and you are good to go. You’ll find my recommended sauce just above the recipe. How long does it take to make BBQ shrimp? Making BBQ shrimp on a grill usually takes 10-12 minutes, plus time to preheat the grill. For this stove top BBQ shrimp recipe, everything cooks up easily, in less than 30 minutes! Cook up the quinoa and stir in some Greek yogurt and cheese. While the quinoa is cooking, steam or roast a few broccoli florets. Heck, nuke a frozen steamer bag if you want to. Quickly saute a few shrimp in a pan on the stove top, then toss them in your favorite barbecue sauce. Add everything to a bowl, and voila! You’ve got a fancy shmancy BBQ shrimp quinoa bowl dinner! You will love this meal. The Hubby has always turned up his nose at quinoa, but make it a little creamy and cheesy, and he has second helpings. The Bug, while still admittedly not the biggest quinoa fan (he has texture issues – won’t eat couscous either) will eat some, and he devours the shrimp and broccoli. And after he devours it, do I get a “Thanks, Mom!”, “Yum.”, or “I’m full.”? Forget it. All I hear is, “What’s for a snack?” Ugh! 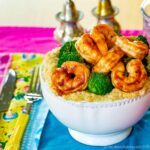 Bang Bang Shrimp – I bet this gluten free recipe from my blogging friend Holly would be delicious served over cauliflower rice! Shrimp Creole – This recipe, from my blogging friend Becca, would be awesome with leftover quinoa from the quinoa bowls! Apple Butter Bacon Wrapped Shrimp – I have 3 words for my blogging friend Brandy’s recipe… OH EM GEE! 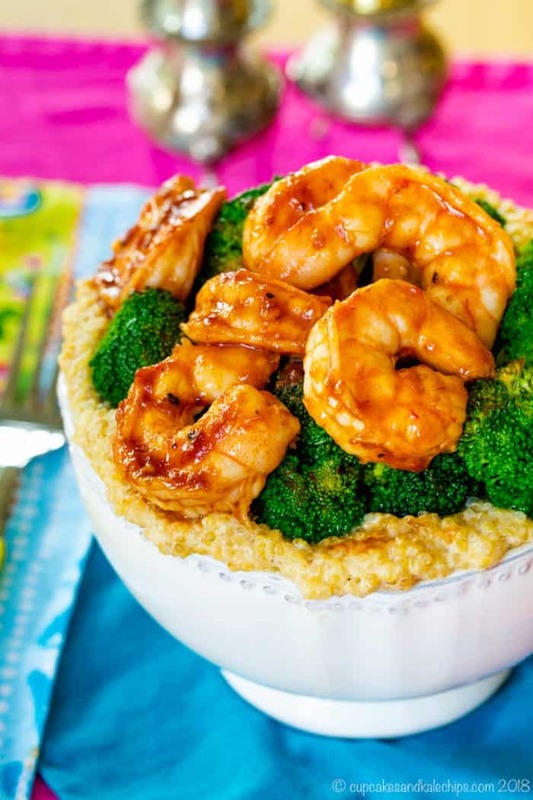 What is the best barbecue sauce to make BBQ Shrimp Quinoa Bowls? 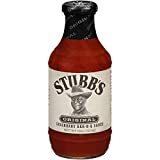 My favorite BBQ Sauce is Stubb’s Original Bar-B-Q Sauce. It’s just a little sweet and just a little spicy, and has the most amazing flavor. Plus there is no High Fructose Corn Syrup, but it’s still available at a reasonable price compared to some other higher end brands that are also sweetened with brown sugar or molasses, but none of the fake stuff. Plus Stubb’s states right on tha label that it is gluten free. And trust me, they are not paying me to say this. It has been my go-to for years. And if you would like that same flavor profile, but a bit more sweet or heat, they have a Sticky Sweet variety, as well as a Spicy version. Quinoa bowls are a simple and versatile dinner that comes together quickly for busy weeknights. 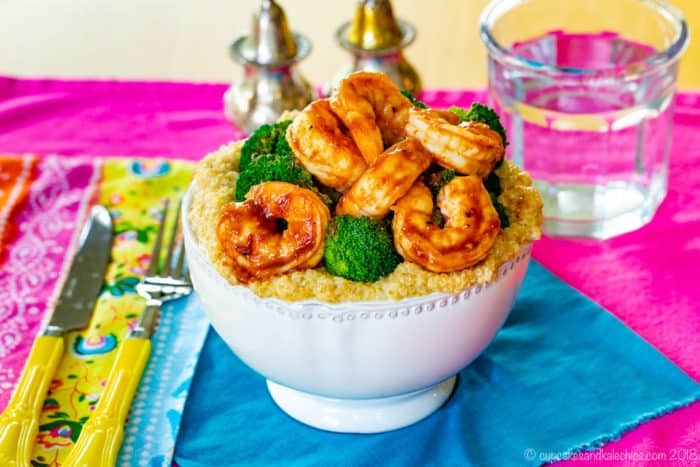 BBQ shrimp and steamed broccoli served over cheesy quinoa are a delicious dinner the whole family will love! Combine quinoa, broth, a pinch of salt and pepper, and dry mustard in a pot, and cook according to package directions, about 15 minutes. While the quinoa is cooking, prepare broccoli as desired, and heat a pan over medium heat. Coat with olive oil spray or nonstick cooking spray (or 1 tsp oil). Add the shrimp to the pan, and cook about 2 minutes per side, or until shrimp is pink and nearly cooked through. Pour the barbecue sauce over the shrimp and toss to coat. Cook for another minute or two, until shrimp is cooked through. Divide quinoa between four bowls. 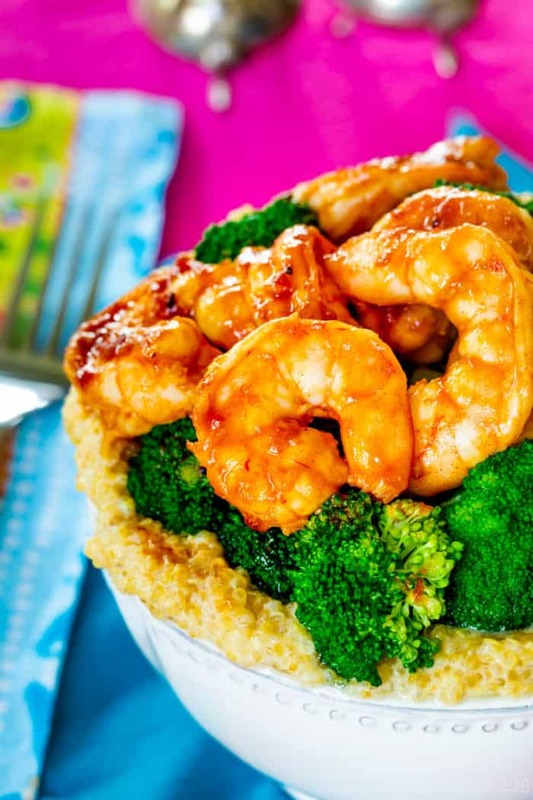 Top with broccoli and shrimp, and additional barbecue sauce, if desired. « Cooking Planit & T-fal Cookware Giveaway COMING SOON! We just had this for dinner. The husband & kids loved it!! I wish I would have liked it more… but I just can’t get over my weird dislike for greek yogurt. Try as I might, I just despise it. I think I might try it with some sour cream. Not quite as healthy, but should come out similar! Glad the family liked it. Yes, some people love Greek yogurt, some hate it. You don’t use a lot, so sour cream won’t make it terribly unhealthy. This was surprisingly good. Wasnt too sure about the quinoa mixture but was very good. Thx for the new recipe. So glad you liked it. 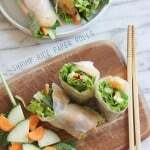 I love that you can easily switch it up with veggies and proteins! On behalf of the 1200+ farm families who own Cabot, thanks for the mention!! Yes, that was sort of my inspiration. And I am happy to support a great company and product. I’ve got weird texture issues with shrimp that I’m trying to get over, but these bowls have everything that I like. I’m sure I could get over it for this recipe! 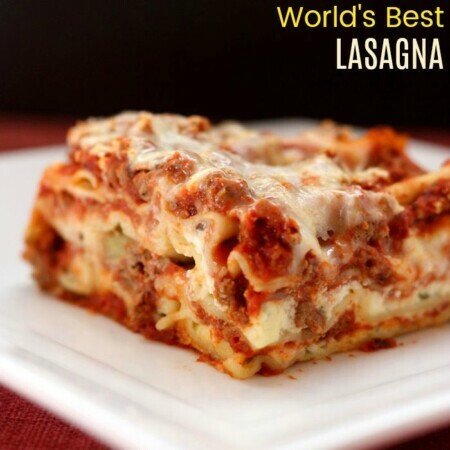 That is the great thing about this recipe – it’s versatility! We hadit with turkey sausage the other night, and chicken or pork or, heck, probably tofu would be equally as tasty! Thanks! I think creamy, cheesy quinoa would be a good first introduction! Too funny about the reactions of your kids at mealtime. I think this is one way I could get my husband to eat quinoa. 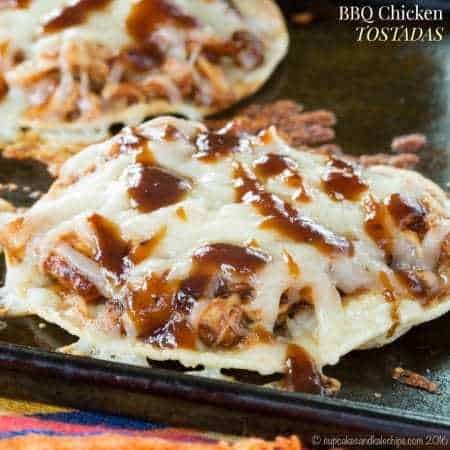 Great secret about making it cheesy and creamy. I shouldn’t complain – he does eat well! Thanks Renee!